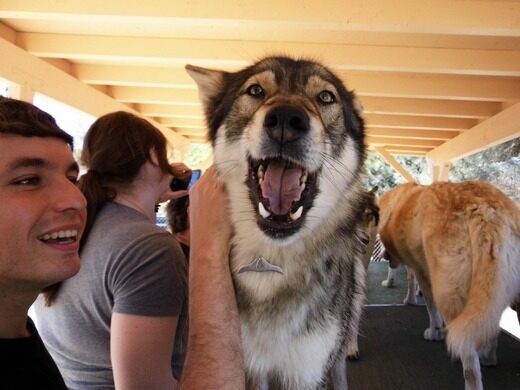 A once-in-a-lifetime chance to meet and play with a pack of hybrid Alaskan Timber Wolves. 9:45 a.m. to 2:00 p.m.
Visit one of the few places where you can have hands-on interactions with the long misunderstood wolf. 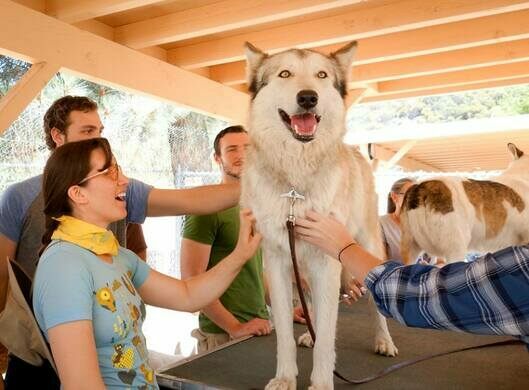 The wolf gets a bad rap. This keystone species, which is at the center of our ecosystem, has been depicted as a villain. Take the Big, Bad Wolf, for example—ferocious, fierce, and completely untrustworthy—or as in "a wolf in sheep's clothing" (or, in the case of Little Red Riding Hood, in Granny's nightgown). 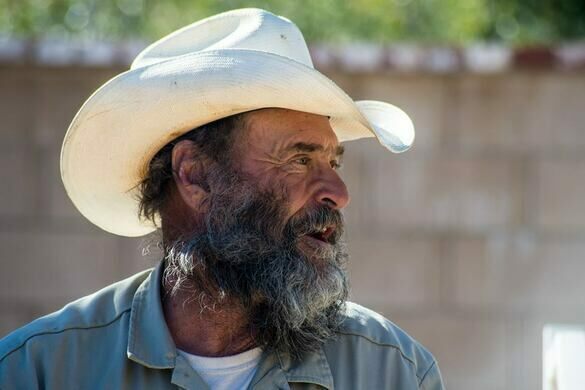 Join Atlas Obscura and Shadowland Foundation on a field trip to their 11-acre ranch, which has been arranged especially for the LA Obscura Society. There, we'll gain rare access to a pack of hybrid Alaskan Timber Wolves that were rescued out of Denali National Park. Part Two! Ready to meet the world's largest bird? 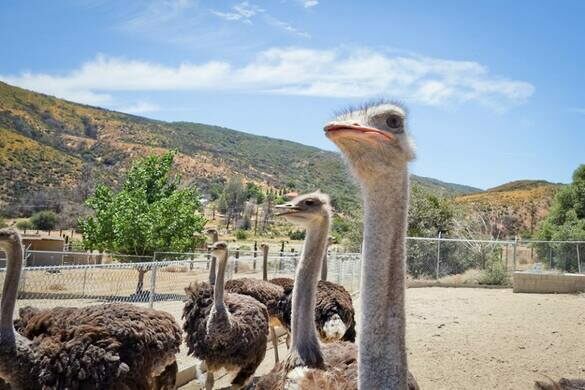 After we bid adieu to the wolves, we'll drive half a mile down the road to visit Quail Run Ostrich Ranch, where we'll meet ranchers Lou & Jacquie Royce. 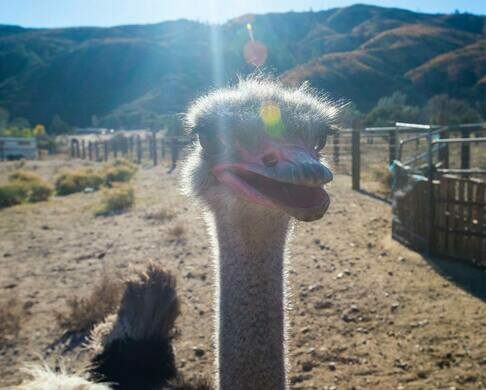 Lou will share some amazing facts about ostrich behavior and physiology and then introduce you to his flock. 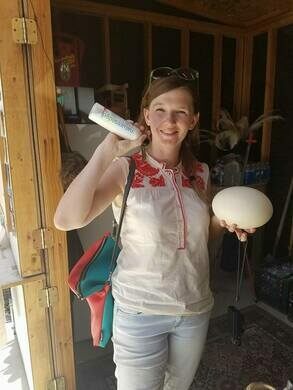 Swing by the gift shop on the way out to purchase ostrich eggs, oil, lotion, and more! A signed liability waiver is required from all attendees (including minors). 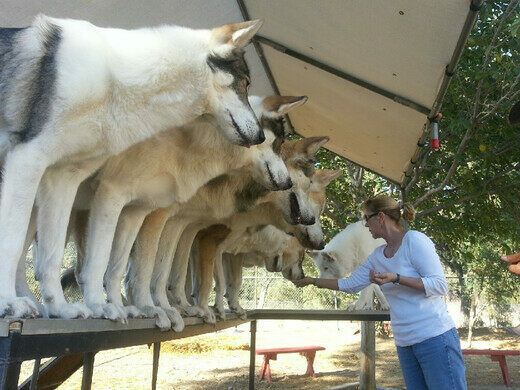 The ticket for the hybrid wolf and ostrich event is family friendly! No children under age 8, and all minors under 18 years old must be accompanied by an adult. Please note that this takes place in Lake Hughes, approximately 90 minutes north of Downtown LA. Event may be rescheduled because of severe weather or other emergency conditions that make the area unsafe for you (and the wolves). Wear closed-toed shoes, long pants, and other clothes you won't mind getting dirty. A portion of the proceeds from ticket sales will be donated to the Shadowland Foundation.